In a striking hilltop location, visible from the vale of Rothes, is sited the Auchroisk distillery. The unusual name meaning ‘ford of the red stream’ in Gealic, refers to the Mulben Burn from which the distillery draws its cooling water. However, the principle reason for the siting of the distillery is Dories Well an abundant source of soft, pure springwater. Through the smoke and nutty sweetness, comes the unmistakeable feel of Dories silky water, followed by a dry, well-balanced finish. Released in 2001 as part of the (later-monikered) Flora and Fauna range, this 10 year old expression from Auchroisk was pretty much the only official bottling available for quite some time. 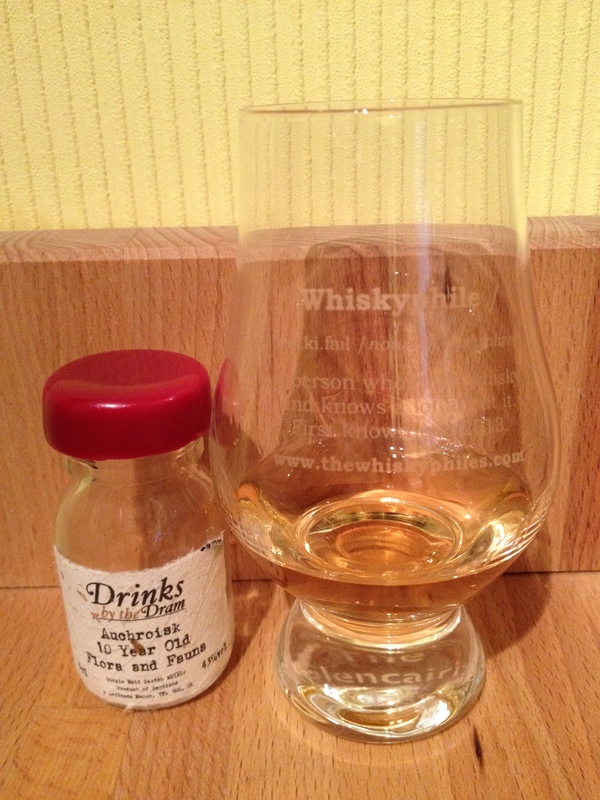 Auchroisk has more recently featured in the Diageo Special Releases, with a 20 year old in 2010 and a 30 year old in 2012. By now we have sample dseveral of the Flora and Fauna range and the uniformity in some of the whisky colouring is really pointing us towards caramel coloration. I have started to become a little apprehensive when faced with these ubiquitous golden drams as some have been hit and miss. This one however went down a charm. Beautifully creamy and sweet with plenty of nut and possible hints of peat influence – this one feels like stepping into a patisserie and smelling all of the freshly baked goodies! A shame there are not more stable (or less limited edition) expressions from Auchroisk distillery.